If the camera is in point A, the perceived color on the water surface will be the color of the object visible from point B through the same intersection point. Point B is exactly the same far from the plane of the water as point A - the two distances are marked with letter "k" on the figure. 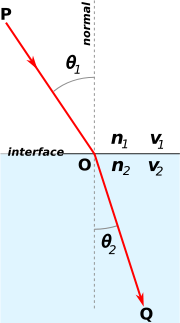 These angles are measured in respect to the normal-vector of the boundary between the two media. In this case the velocity is lower in the second medium (V2<V1), the ray in the second medium is closer to the normal-line. The index of refraction for air is 1, for water is 4/3. , where the underscored elements are vectors. This equation contains the possibility to have negative square root, which means that the equation is not defined for every angles and coefficients. The physical reason for this is described in the following paragraph. There is one more important phenomenon that I need to mention in connection with refraction. If the light is coming from a media with lower velocity, the angle will change from the normal, so the angle between the normal and the beam will be bigger in the target media. This means that to get 90 degree in the target medium a smaller angle is enough in the source medium. This specific angle is called critical angle. 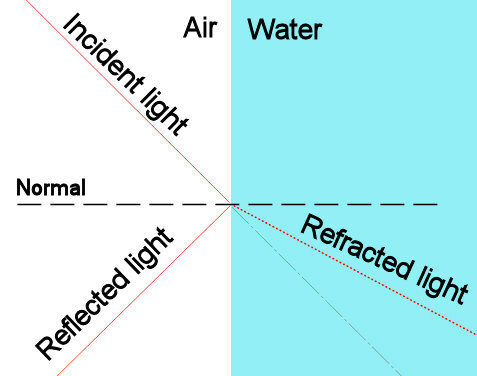 The critical and any higher angle results a refraction vector which is parallel to the surface of the media. If this happens, the wave will be refracted along the border of the media, it will not intrude the target medium, the so-called total internal reflection will occur. This critical angle is about 50 degree at a water-air boundary. The sources of these illustrative images are Wikipedia and http://www.glenbrook.k12.il.us. The source of the image is . But how to get the accurate ratio between reflection and refraction? Augustin-Jean Fresnel (/freɪˈnɛl/) worked out the laws of optics in the early 19th century. His equations give the degree of reflectance and transmittance at the border of two media with different density. Derivation of them is outside the scope of this paper. The wave has two components: a parallel and a perpendicular. 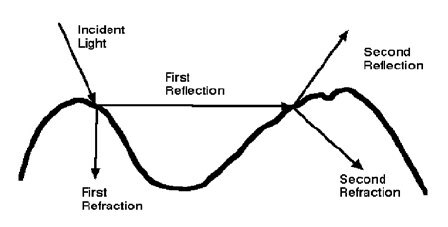 Ei is the amplitude of the incident wave, Er and Et are the amplitudes of the reflected and the transmitted wave. θi, θr,, and θt,, are the angles between the surface normal and the beam of incidence, refraction and transmittance. As visible on the figure, in case of moving from denser medium to a less dense one (on the right), the reflection coefficient is 1 above the critical angle. This phenomenon is known as total internal reflection, as metioned earlier. Materials having a flat surface (e.g. : leather, glass and water also) present an interesting phenomenon which I have not mentioned yet. There are several different reflection models, some of them make the created image much more realistic while others help to improve the smaller details. One of these in the second group is specular reflection. But if the material has flat surface, the light waves will be parallel after reflection as well. Because of this property shiny, bright spots will be formed on different materials, for example, on leather, metals, or on water if they are illuminated from a certain angle. The Phong illumination model describes this in the way which is most commonly used in 3D computer graphics. Phong Bui Tong developed his model in 1975 and it is still very popular. 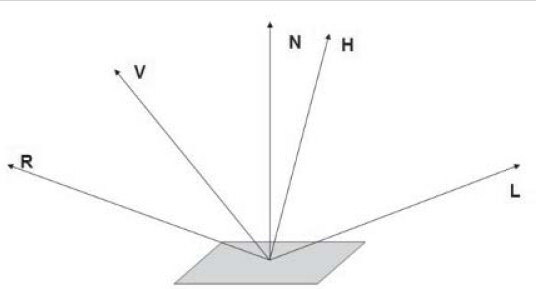 According to this model the intensity of point has three components: an ambient, a diffuse and a specular component and the specular highlight is seen when the viewer is close to the direction of reflection. The intensity of this kind of light falls off sharply when the viewer moves away from the direction of specular reflection. Where "·" is the dot product. Where Is are the different intensities, ks are the ambient, diffuse and specular coefficients, and · is the dot product. Namely, the intensity of a point is equal to the sum of the ambient light-intensity and the sum of the diffuse and specular intensity scaled to the distance of the light-source. 1. Mathematics for Game Developers – Christopher Tremblay – Thomson course technology. 2. The elements of nature: interactive and realistic techniques.